Over the last ten days I have been delighted to bask in a bed of colour, to be nurtured by the warmth of a Rarotongan summer, to be seduced by the scent of vibrant Pasifika flowers. The occasion was a family 50th birthday. Every day was an opportunity to celebrate life and love; to reflect on the blessings of whānau. When internet permitted news from home flowed in: the tragedy of tangihanga that touched our lives: Pīhopa Kingi, Heni Tawhiwhirangi, Conway King, Sandra Reuben, Phyllis Paul and others. As our tears fell, we thought of the whānau gathering at Tuahiwi, at Rehua, at home and afar, to mourn loved ones. It was another reminder just how precious our whānau are; how every moment counts. It was disappointing to miss the Ngai Tahu Hui-ā-Iwi: a festival held every two years where whānau come together and reconnect. I was so proud to hear of all the reports from our team, our entities, our whānau who came to Tuahiwi under the context of the theme ‘Paiheretia te Ture Tangata ki te Ture Wairua’; to light the flame of peace, of hope, of justice. The Hui a Iwi was also an excellent opportunity to congratulate and celebrate the newly appointed Kaiwhakahaere, Lisa Tumahai and Kaiwhakahaere Tuarua, Matapura Ellison. Lisa, of course, was the inaugural Chair of Te Taumata and is currently a director on the General Partner Limited Board. Braveheart Christchurch is a means of sharing the stories of the unsung heroes who are taking a risk, or have tried something new, and are making Christchurch a better place to live, work, study or visit. Rangimarie Parata Takurua is the driving force behind Te Pā o Rākaihautū. The demand for Te Pā has raised from the growing need to see more Maori students succeeding in the education system. Starting a school is not for the faint hearted and that's why this week Rangimarie was awarded a Braveheart Award. Congratulations Rangimarie – we are so proud to be working with you! Tomorrow (Sunday) we head to Arowhenua Marae to begin three days at Glentanner Park Centre. The focus for the summit is how to best achieve the outcome of leading healthy lifestyles, through a focus on traditional and contemporary physical activities, in the context of Aoraki waiata and whakapapa. Special guest speakers include Sheldon Pitama (NZ Junior Kiwi; Ngai Tūāhuriri, Ngai Te Rangi); Kiriana Wairau-Hunter (Black Sticks representative) and Jaye Pukepuke (Bros for Change). It was a great pleasure to speak at the graduation ceremony of our incubator programme – Te Pāpori o Whakatere. Te Pāpori o Whakatere is designed to support our initiatives with the nuts and bolts of successful enterprise. Over the last eight sessions, two days a week, the ‘tauira’ have learnt about working up on their policy needs, understanding where law and business meet, finding out about insurances, about creating a strategic plan. They get an overview of ACC and a direct connect. They sharpen up on marketing and branding, on vision, on finances, on people and relationships. It was wonderful to be present at the inaugural Kapa Haka Celebration at Haeata on Thursday night. Te Rau Ika – their auditorium – was crowded to almost standing room only as kapa haka was performed from their pēpi to their rangatahi. A fabulous night including a stellar presentation by the kaiako who took to the stage in support of the kaupapa. We thought you might be interested in the link below to a video put together by some of the talented young Maori students who have not been able to experience success in mainstream education, but are now thriving through the means of Te Kaupapa Whakaora. We are proud to invest in two Whānau Ora Navigators at Te Ora Hou to support the excellent work being undertaken by Jono, Sharyn and their team. This video helps to tell their story of what works. 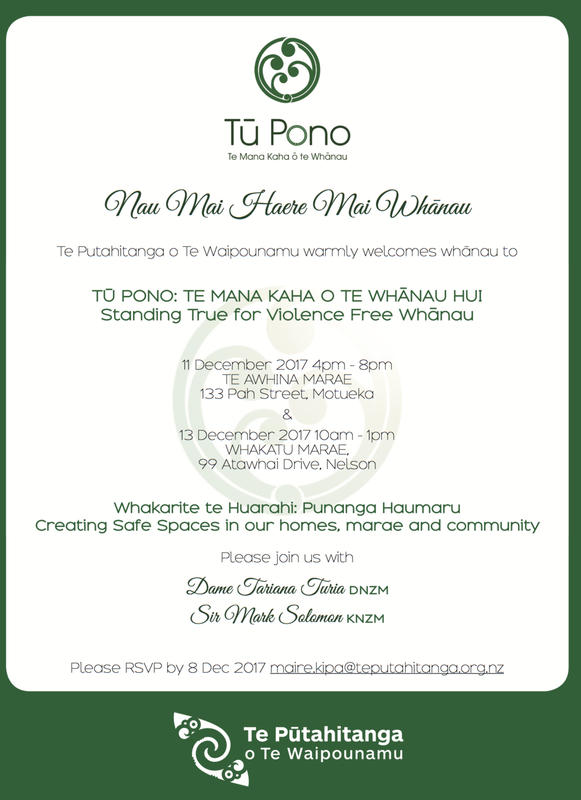 Tuesday 5th December: Open day, 11am-1pm, Nga Hau e Wha Marae, Christchurch. BBQ at 12! Strategic Analyst Position now open! We have an exciting opportunity for an experienced analyst to join our team at Te Pūtahitanga o Te Waipounamu! The Strategic Analyst will lead policy research and analysis, to provide sound advice across a diverse range of work streams. You will be driven, focussed and able to demonstrate your ability to anticipate potential issues, assess risk and initiate responses that align with Te Pūtahitanga vision and values. In this role you will engage with a variety of stakeholders from central government to whānau at flax roots, these relationships are critical to ensure context and quality of policy analysis and advice. If you are looking for an exciting and rewarding new opportunity to support the realisation of Whānau Ora, then this role is for you. To apply please follow the link below and apply online. For further information and confidential enquiries, please contact Sara Smith, Advisor - People and Performance on 03 974 0029. The Strategic Analyst role is now advertised and will close on Friday 8th December.